Cancer Gets LOST is honored to be hosting silent charity auctions at two upcoming fan events, as well as a massive global online charity auction in 2018! 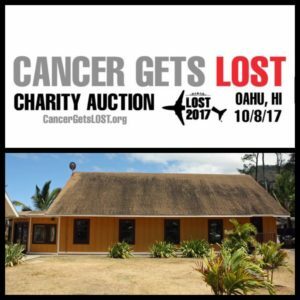 Taking place in iconic Dharmaville (which is actually an active YMCA camp on Oahu in Hawaii) on October 8, 2017 – CGL is absolutely thrilled to be hosting a silent charity auction at the LOST fan event LOST 2017! Featuring all LOST items (many kindly donated and/or signed by cast and the creative team), the auction is open exclusively on site for event attendees. 100% of all proceeds from this auction will be donated to PanCAN, in honor of my mother-in-law. At LOST 2014, CGL raised just over $11,000 for the American Cancer Society, thanks to the tremendous generosity of attending fans that participated in our auction! CGL is very excited to return to Vancouver in January to host our second annual silent charity auction at Unity Days 2018! Produced by Unity Events Canada, Unity Days is a unique and terrific 3-day event dedicated to The CW series The 100. Our auction will feature The 100-related items exclusively for attendees (a large number of which have been donated and/or kindly signed by our friends from The 100). And we will be donating 100% of the proceeds to PanCAN once again. At Unity Days 2017, CGL raised and donated over $4,000 to the Pancreatic Cancer Action Network thanks to generous fans that bid on and won various The 100 items in our auction! Our next big online charity auction will launch on August 1, 2018! We already have items from over 50 television shows and 15 films, thanks to the incredible generosity of fans and industry friends alike. Due to the sheer size of this auction, we are still working on logistics (online auction host, shipping company, etc. ), so please stay tuned here and on our social media for updates! 100% of the net proceeds from this auction will be donated to a specific cancer charity (to be determined in early 2018). If you’re an LA-based photographer and interested in possibly donating a day or two your time to assist us with auction photography next summer, please let us know! In an ongoing campaign, we have partnered with the lovely team at Fangirl Shirts to offer “Be The Fan You Wish To See In The World/#ChooseKindness” tees and mugs! 50% of the proceeds from each item sold will be donated to PanCAN. Thank you for your ongoing support. Cheers! CGL 2017-2018 Charity Auction Update & Schedule! Hello, patient friends and kind supporters! We wanted to let you know our charity auction schedule for this year and next, as well as provide a wrap-up of our very successful auction at Unity Days 2017. Our friend Sachin Sahel (Jackson) stopped by the Unity Days auction! In January, we hosted an onsite silent charity auction at Unity Days in Vancouver, Canada. Unity Days, hosted by Unity Events Canada (who kindly chose CGL as their charity of choice), is a fan event/convention celebrating The CW series The 100. Our auction featured 70 items, many signed by our friends in front of and behind the scenes on The 100. Thanks to the generosity of attending fans, we raised $4,600 and donated every cent to PanCAN (Pancreatic Cancer Action Network)! Note of gratitude to all that donated, signed and bid on items in this auction. 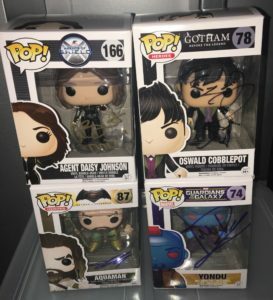 Shout-out of appreciation for our UD auction volunteers: Lisa C, Jen S and Layhan – as well as the many sweet fans that donated signed items for future auctions! In addition, I had the great pleasure of moderating the actor panels at Unity Days – and they all signed additional The 100 items for future CGL auctions. Working with this cast over the last few years has been an absolute pleasure; they are all incredibly generous with their time, and I look forward to collaborating on future charitable endeavors with them. 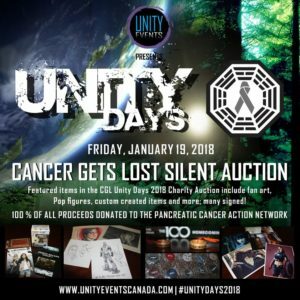 It certainly seems as though there will be a Unity Days 2018, and if so – Unity Events Canada has already said we are invited us back to host another onsite charity auction! On October 8 of this year, we are honored to be hosting an onsite silent charity auction at LOST 2017, a fan event on Oahu (Hawaii)! To be honest, we are thrilled to be able to host this auction in the infamous YMCA camp that served as Dharmaville on LOST. We previously hosted an auction at LOST 2014, and raised almost $12,000 for the American Cancer Society. This year we will be donating 100% of the proceeds from our LOST 2017 auction to PanCAN, in honor of my mother-in-law, who is battling stage 4 pancreatic cancer. We have over 100 items ready for our LOST 2017 charity auction, including several signed magazines, trading cards, posters and more! Thank you to those that have donated and signed items; we anticipate raising a few thousand dollars for the cause, and really appreciate your contributions. As you know, we host our large online charity auctions every other year. We are hard at work on our big 2018 auction, and thanks to generous fans and actors/writers/producers – we already have items from over 40 TV shows and 10 films! Once the launch date of this auction has been decided, as well as the charity of choice we designate to receive the net proceeds, we will let you know. See you on the other side, and may we tweet again!